Take another look! This property gets my D.U.E. (Distinctive, Unique, Exceptional) stamp of approval! 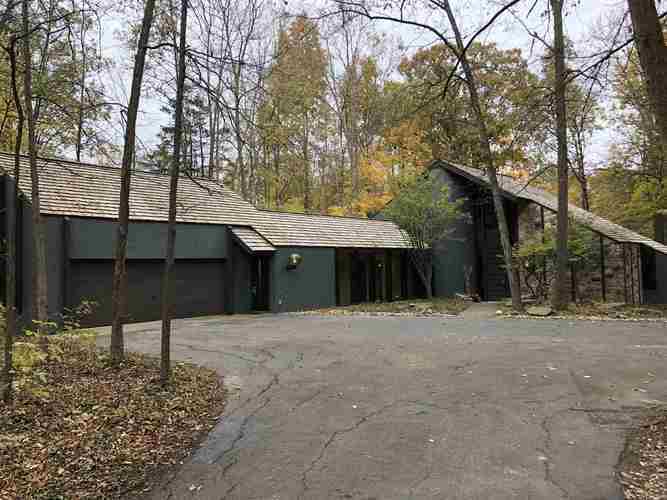 Frank Loyd Wright would be proud of this custom built, contemporary/retro home in the midst of a 1-Ac wooded parcel w/ravine & small stream! You won't know if you're inside or out when you look through extensive windows & skylights. An elevated screen porch overlooks the peaceful valley of trees! The vaulted GR includes natural stone walls & cozy gas log FP. Sit in the sunken reading pit & enjoy a triangular window view to the outdoors. The DR has a large built-in cabinet w/display case. You will love the updated kitchen w/newer stainless appliances, stone tops, extensive cabinetry & coffee/drink bar. Chill your wine in the new chiller or store it downstairs in the wine area complete w/wrought iron gate, & over 60 wine slots! A large hearth room serves as an additional eating area or awaits comfortable chairs and coffee table. A large main floor laundry provides convenience & plenty of storage. MB suite includes an outer den/study w/ floor to ceiling shelving w/ glass doors w/library ladder. The MBB has new ceramic around the jet/garden tub, beautiful vanity, & large closet w/organizers. The second full bath includes it's own shower! A FIN BSMT includes theatre room, 1/2 bath, & huge rec rm for all your exercise equipment or home based office w/lots of cabs & built-in desks! You'll get a steam spa, bonus room for guests, woodworking shop & much more! UPDATED! Directions:Coldwater to Gump Road or Old Auburn to Gump Road to entrance of Woodcliffe Estates then on Woodcliffe Trail. Home on Left.